BikeCommuters.com > advocacy > Bicycles outselling cars!!! Read more of the link-heavy article by visiting the NPR page directly. 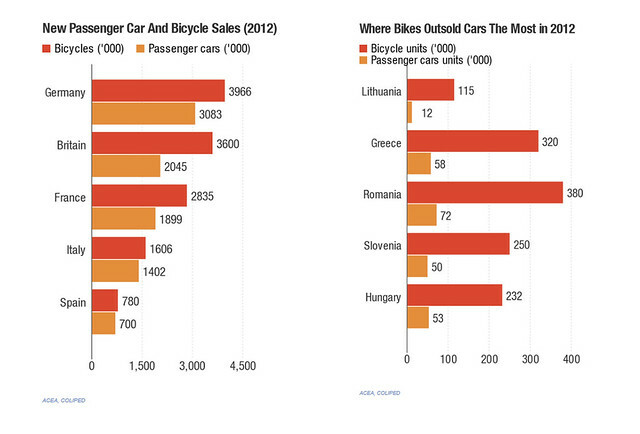 We are still hoping to see a similar comparison between car and bicycle sales in the U.S. If anyone out there has stumbled across such numbers, please let us know. Momentum Mag had a write up a week ago. Bike are outselling cars in the US, but it is still mostly for recreation(75%). Momentum linked to a National Bike Retailers report. The number get very interesting as to where bikes are purchased. 75% are sold through the Mass Merchant channels- Walmart,Target. Too bad there’s not a way to track used bike sales as well. I’ve got a feeling that those numbers would be up too. @Raiyn — true dat. Bicycles have got to be the most recycled consumer product in existence. I own several bikes that have had several owners before me, and I know the used market is HUGE! Oddly, mine were either bought new or were one owner rigs (including childhood hand-me-downs). Even my Varsity was a one previous owner job.